Announcing the release of IVRRAC. 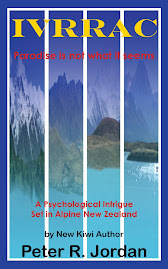 A new psychological intrigue set in alpine New Zealand. Please post any in-depth comments on the story here. Simon, a convicted serial killer of the rich, undergoes treatment at a fledgling private criminal rehabilitation firm, IVRRAC. Simon is then sent to the alpine village of Trentsworth, a town full of rich socialite women, to ascertain whether he is cured of his murderous impulses or not. During his stay in Trentsworth, Simon falls in love with his neighbour, Kyndrea, the only child of a rich widower. After a time he realises there is no way she would be able to love him due to his past. Through this anguish he discovers that the rehabilitation process has failed and he is still able to exact his revenge with dramatic and unexpected results. During the aftermath of his actions he is informed what the anagram IVRRAC stands for and the awful truth that IVRRAC has its own dark secrets and Trentsworth is not at all what it seems.